Expungement serves as a sort of a clean up of your criminal record, whereby any information regarding your arrest and any subsequent court proceedings are sealed. Legislation passed in 2014 makes this process more widely available to individuals throughout Alabama. If you are granted an expungement, this information will not be visible in any criminal databases, including those managed by the federal government at the FBI. 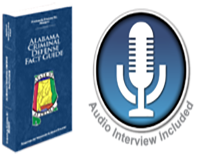 Not all cases are eligible for expungement in Alabama. In fact, if you were found guilty of either a misdemeanor or a felony charge, you may not seek an expungement. You will incur some expenses when seeking an expungement in Alabama. There is an administrative filing fee of $300, plus approximately $300 in court costs, a certified records fee of $100 as well as your attorney’s fee. Although an expungement does require some time and expense, it is a small price to pay for the benefits that come with having a clear criminal record. If you or a loved one is interested in seeking an expungement, our firm can help. Call us today at (205) 871-8838 to schedule a free, no-obligation consultation.